A tobacco giant behind three of the UK's leading brands is under investigation after millions of its cigarettes were shipped to a firm linked to a billionaire accused of playing a key part in suppressing the popular uprising in Syria. The development has revived concerns about the ability of "big tobacco" to police its distribution networks – third party agents who move its product around the world. Japan Tobacco International (JTI), which owns the Silk Cut, Mayfair and Benson & Hedges brands, faces questions over its relationship with a firm associated with Rami Makhlouf, who is subject to European Union and US sanctions. 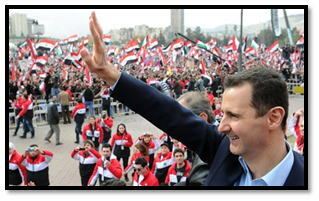 Documents obtained by the Observer show that on 27 May 2011, JTI's Middle Eastern distributor, IBCS Trading, dispatched 90 million cigarettes to Syria Duty Free Shops (SDF) Ltd.
Makhlouf, a cousin of the country's president, Bashar al-Assad, was the main shareholder in SDF on 9 May 2011, the day the EU subjected him to sanctions for providing "funding to the regime allowing violence against demonstrators" and for being "an associate of Maher al-Assad", the feared commander of Syria's Republican Guard. He has become the target of anti-Assad demonstrators in recent weeks as the UN attempts to agree a resolution on imposing further sanctions – strongly opposed by Russia and China. A spokesman for JTI, which is based in Geneva, confirmed that the EU's anti-fraud watchdog was reviewing the Syria shipment as part of an investigation into the company's distribution network. "We're co-operating with them," the spokesman said of the EU watchdog. He said SDF had never been subject to trading restrictions and that JTI suspended shipments upon learning Makhlouf was a shareholder. "We have not received or processed any orders [for SDF] since 19 May 2011," the spokesman explained. "Neither we nor our distributor have been paid nor have we… [sought] to be paid. As a measure of precaution, the relationship with Syria Duty Free has been under review to ensure it will not benefit anyone under censure." Makhlouf, one of several cronies bankrolling the Assad regime, whose security forces have killed an estimated 6,000 people since the uprising began, has been subject to US sanctions for three years. He claimed to have disposed of his interests in SDF on 20 May 2011. However, the US government said it believes he is "disassociating himself" in name only from his businesses. JTI's relationship with its distributors is now under acute scrutiny following a leaked internal inquiry. A dossier compiled by David Reynolds, a former CIA agent who became JTI's head of brand integrity, alleged its distributors were smuggling cigarettes across more than a dozen countries to avoid paying tax. Much of the product, it was suspected, went to Iran. In April 2010, Reynolds complained in an email to Ryuichi Shimomura, JTI's legal officer, that executives were failing to tackle the problem. With regard to smuggling tobacco from Russia into the more heavily taxed EU, Reynolds wrote: "Shipments to unauthorised buyers have reached a massive scale exposing the company to fines potentially of around €30m… We have repeatedly reported our findings to JTI management… but have yet to elicit any concerted effort to halt these diversions… My team have been directed not to investigate several instances of smuggling related to specific JTI distributors – and the possible involvement of JTI employees with known smugglers." Reynolds was sacked three days after sending the email, which was obtained by the Organised Crime and Corruption Reporting Project, an investigative network backed by the UN and USAid, the American aid agency. The allegations are an embarrassment for JTI, which owns the former FTSE 100 tobacco company Gallaher and has 39% of the UK market. In 2007, JTI agreed with the EU that it would pay $400m to tackle smuggling after accusations that it had failed to address the problem. It claims it has "strict criteria" for identifying its duty free customers. "In 2002 parliament's Public Accounts Committee launched a major investigation into the role of the tobacco industry in facilitating cigarette smuggling," said Deborah Arnott, chief executive of the health campaigning charity Ash. "Following numerous hearings and the publication of a highly critical report by the committee, the industry claimed to have cleaned up its act. Yet nearly 10 years later we hear allegations senior executives of JTI/Gallaher allegedly stood by as its distributors engaged in widespread smuggling of its products in a dozen countries." The JTI spokesman described Reynolds as a "disgruntled employee" and said a law firm had investigated the allegations and cleared it of wrongdoing. JTI accused Reynolds and his team of "conduct violations". Reynolds's supporters deny the claims and say his emails show he was always acting in his employer's interests. They point out he is now a senior officer with the FBI and would have been vetted before being allowed to join the bureau.